Sunday at Beautyburg - Blogger Link Love Around The World! Knut the polar bear. We will miss you. Hello beauty friends! How is everyone's weekend? Can you believe the past week and few days? So much uncertainty around the globe. I was relieved that some of my Twitter friends in Japan were ok, but I know that there are many more out there who have lost loved ones. Also thinking about the accelerating circumstances in Libya worries me. 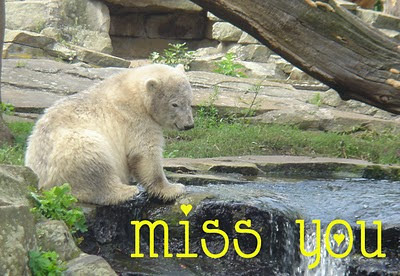 And even though this is such a minute tragedy in comparison, I was sad to hear that Knut the polar bear had passed. I had actually seen him at the Berlin Zoo in 2007. The photo above is one I took from that trip. As you can see, he's still somewhat of a cub in that photo. In times like this, I take a lot of comfort in my blogger friends. There is so much positive energy from them. I just wanted to thank them. A long time ago I was so into graffiti, and I guess I still am. I would photograph graffiti around New York and obsessively read about NYC's graffiti glory days in the late 70's early 80's. I was psyched to see MAC's Senior Makeup Artist Keri B's graffiti inspired manicure. She is inspired by Shepard Fairey, who is most recognized for his Hope poster of President Obama. Her one nail is accented with an Obey Me face, which is actually based off of Andre The Giant. The other hand is devoted to Banksy. Her ring finger is highlighted with Banksy's balloon girl. This mani totally disproves the theory of nail art being cheesy. Check the rest of her blog, Nail Art Junkie, for other seriously awesome manicures. Lipglossing's Charlotte uses Illamasqua's Hollow Creme Pigment to Contour serious cheek bones. What do you think of this technique? I am waiting to get my hands on these. Chloe from Chloe's Nails replicates a gorgeous feather accented manicure. I have to try this myself! Jen from The Polishaholic is having an INSANE giveaway to celebrate her 1 year blogaversary! You go girl! I have high hopes for next week and am trying to stay positive. What do you do to try to exude good energy?